We stayed a couple of nights at Hostel Sheck in Tulum. On our day off from cycling we booked a cenote diving tour to Cenote Angelita and Cenote Dreamgate. Early in the morning of our last day in Tulum we both didn’t feel like it and so we stayed a little longer at the hostel and headed out towards the famous beach ruins short before lunch. What a big mistake! Arriving at the ruins it was crowded with tourists. We already had a bad feeling when we cycled through the mass that made its way from the buses to the entrance gate. At the entrance gate there was no safe place for our bikes in sight and so we decided to skip the famous beach ruins of Tulum. We both wouldn’t have enjoyed walking around such a crowded place. 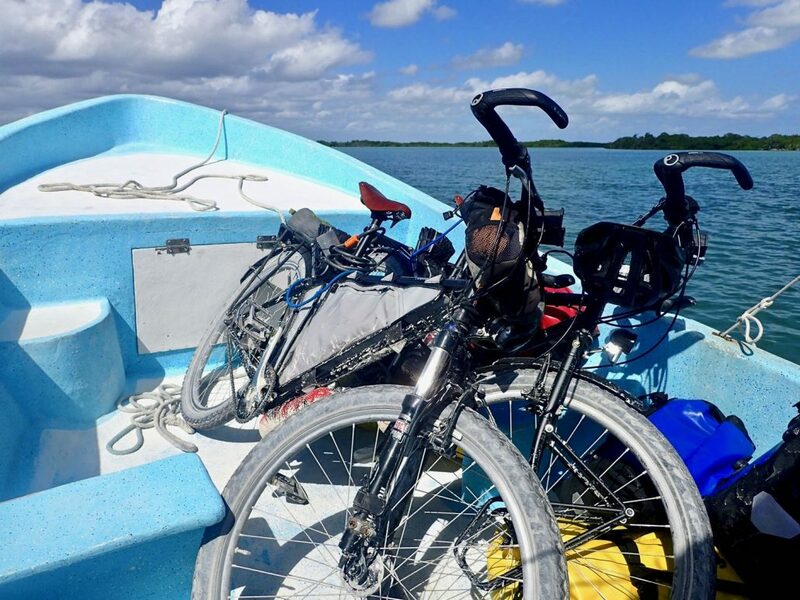 We felt a little sorry but immediately jumped into our next adventure which was cycling through Sian Ka’an Biosphere Reserve. 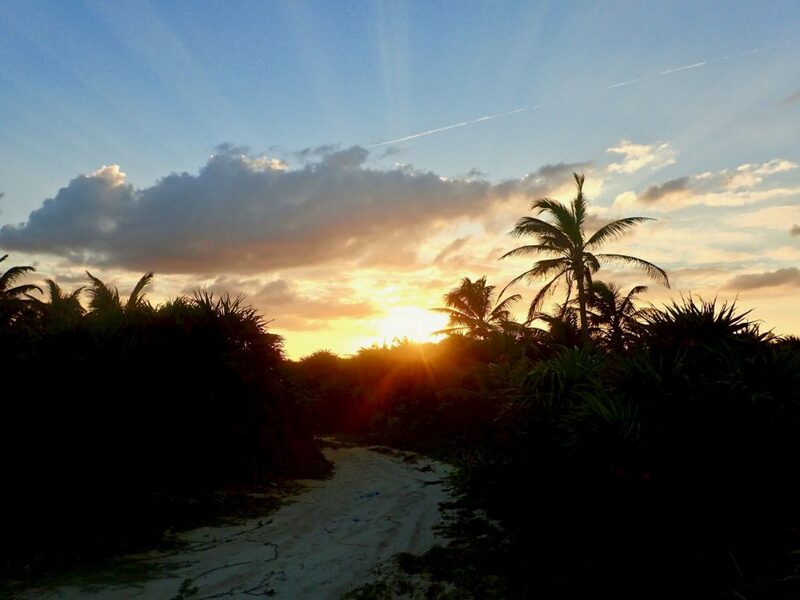 The name Sian Ka’an comes from the Mayan people that once inhabited this area and means “Origin from the sky”. Since 1986 Sian Ka’an is a designated biosphere reserve located south of Tulum which is more known for its famous Mayan ruins at the beach. 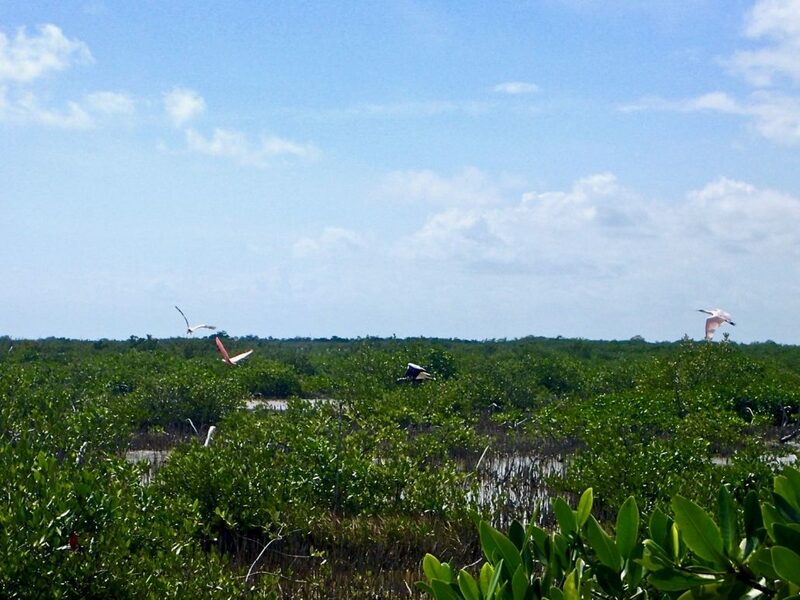 Sian Ka’an also became a UNESCO world heritage site (same as Chichén Itzá) in 1987 and is home to thousands of species. 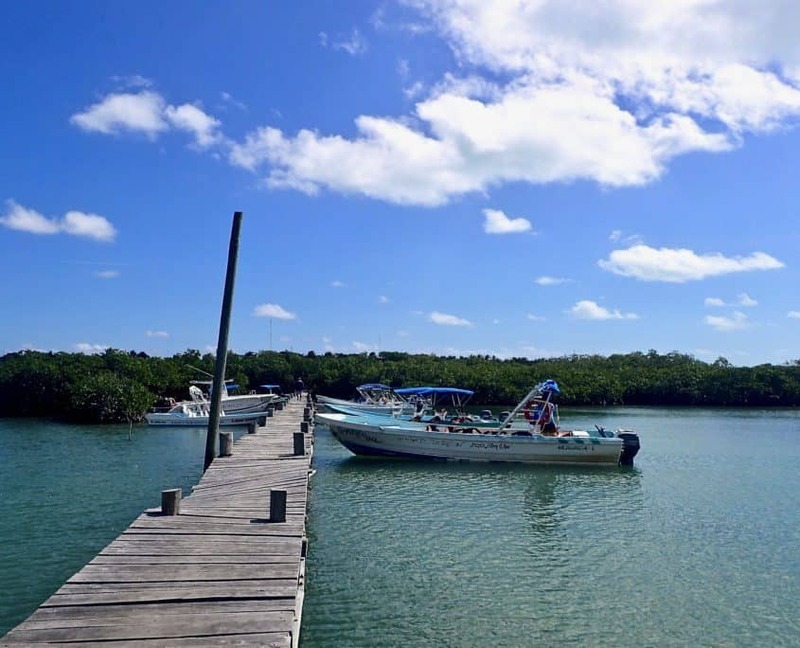 The whole area of the reserve covers more than 5000 square kilometers and also includes a large marine section with a barrier reef. 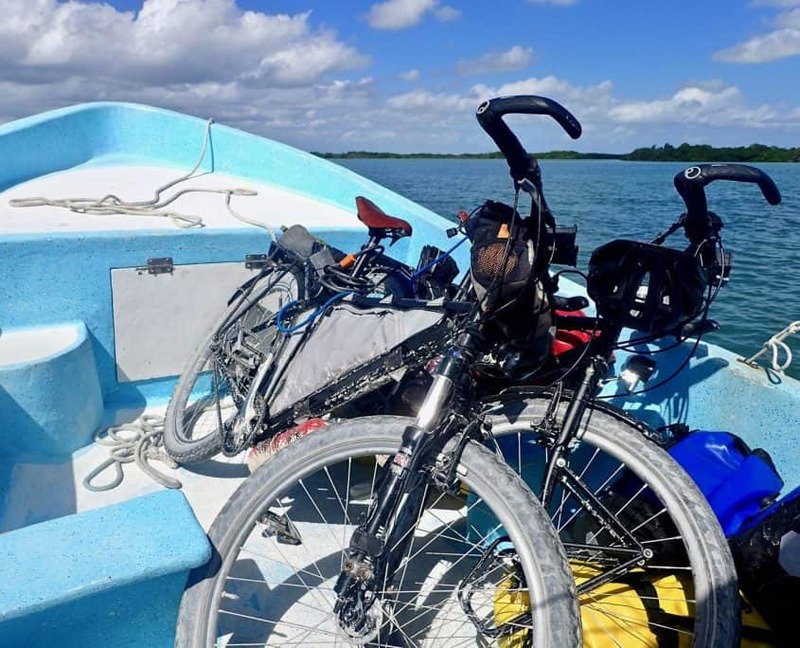 By cycling through Sian Ka’an Biosphere Reserve and traveling on our own – not with a guided tour – we could only cover a small area of tropical forests, mangroves and marshes. 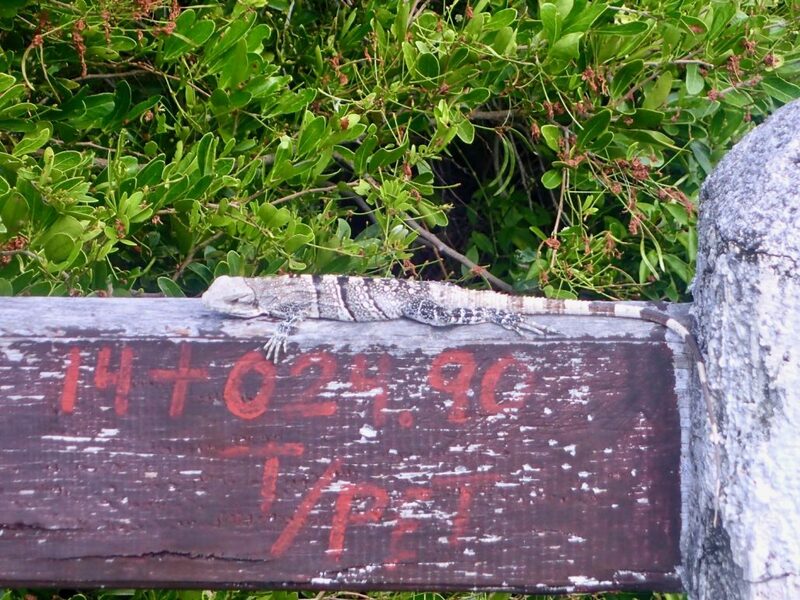 Wildlife in Sian Ka’an Biosphere Reserve is exceptional. Mammals such as Jaguar, Puma, Ocelot and Central American Tapir are living in the tropical rainforests. The marshes are home to crocodiles and of course millions of moquitos. 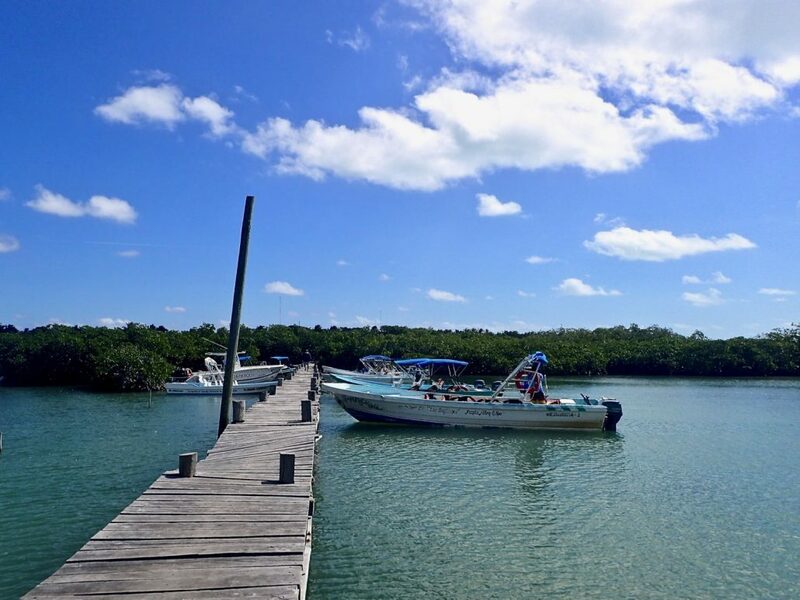 Sian Ka’an also provides a habitat for more than 300 bird species and the marine area is home for the West Indian Manatee, nesting marine turtles and hundreds of fish species. 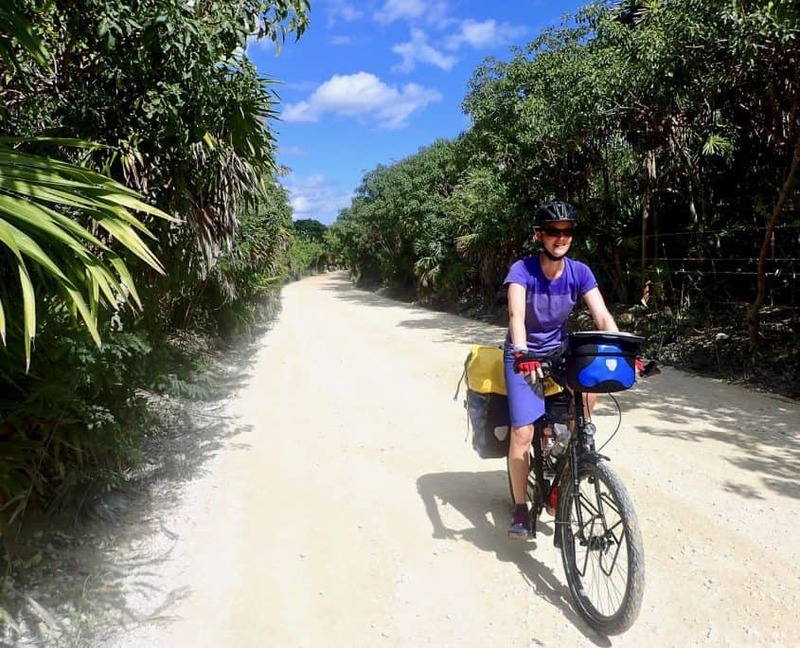 Cycling along the Riviera Maya past Tulum we got at some stage beyond fancy hotels, touristy shops and high-priced restaurants. 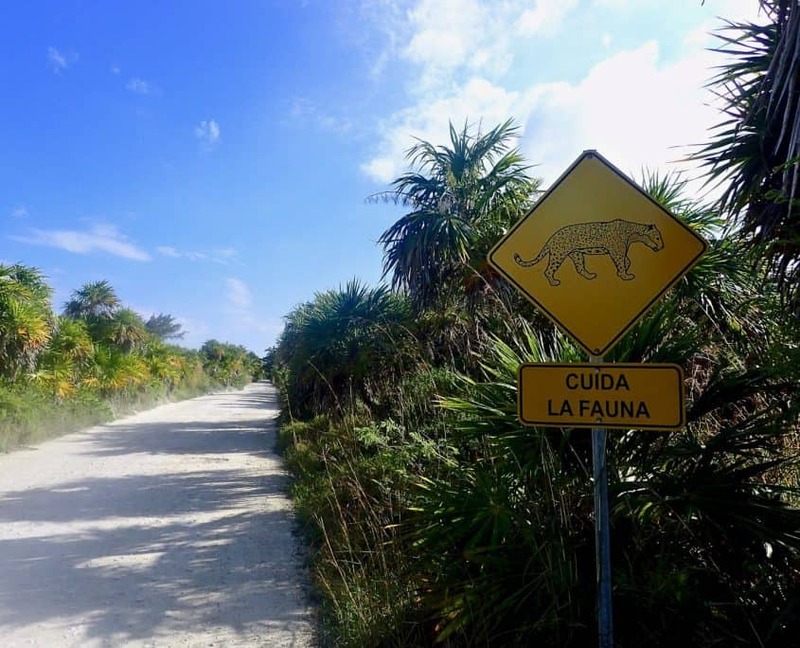 A stone arc over the road marked the entrance to Sian Ka’an Biosphere Reserve. An angry dog barked at us when we cycled towards the entrance to pay our fee. For cyclists the entrance fee is MEX$25. Equipped with a paper band around our wrists we started cycling into the reserve. The road we cycled on instantly turned more demanding. It was a sandy earth road and the potholes in it grew with every meter of progress we made. To our left and right the palm trees and jungle vegetation slowly got more dense. 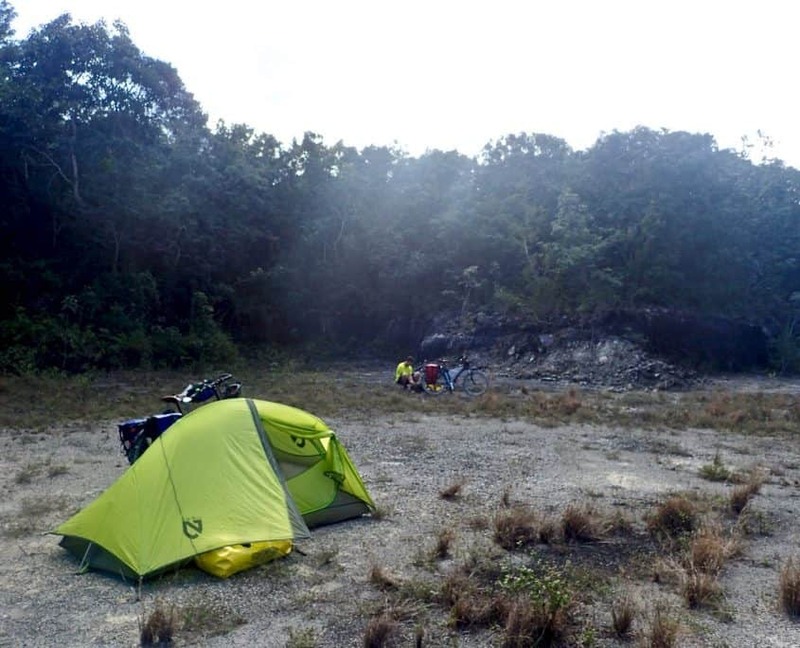 We expected to find an untouched area of natural beauty. Our plan was to cycle for a while and camp on one of the countless wonderful beaches we hoped to encounter. While cycling along the road we asked ourselves more and more where the actual reserve would start. To our left – towards the ocean – one fence after the other prohibited access and countless signs claimed private property. To our right were impenetrable mangroves. The white sandy beaches that looked like paradise all belonged to some fancy eco hotels. Are we not cycling through a Biosphere Reserve? We cycled already for more than two hours when we reached the first open spot without a fence. We made our way through the bushes to try and find our beach paradise. 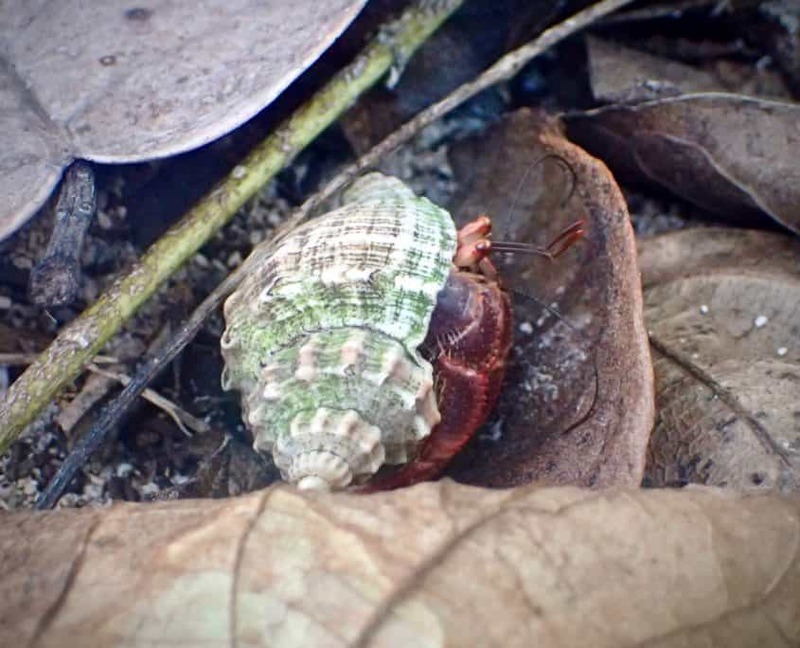 What we found was disgusting. Everywhere we got off the bike to explore the beach area between the palm trees we saw the same: plastic bottles and all kinds of trash were literally everywhere! It is true that Mexicans just throw their trash into the landscape. Ecological awareness hasn’t made it that far and there doesn’t seem to be a trash recycling system anywhere in the country. 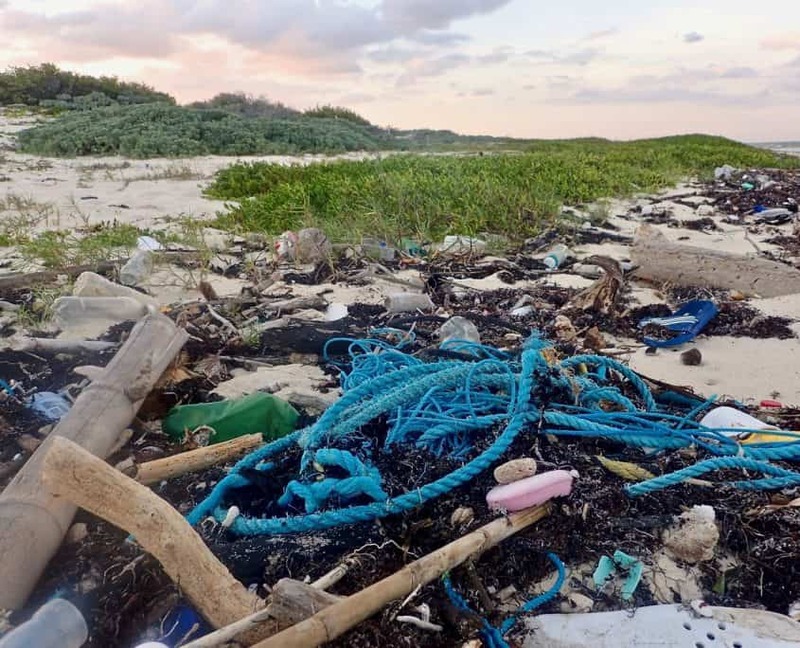 But this time it was obvious that the trash – mainly plastic – had another origin. It came from the ocean! Left behind by the breaking of waves on what is supposed a sandy beach of paradise, plastic bottles, old shoes, plastic bags, plastic cans and all sorts of stuff might have traveled in the water of the Atlantic Ocean for a long time. Maybe some of it came all the way from the USA or even Europe! Walking along the beach I didn’t look for shells but plastic trash when my partner Brad asked the right question. “What can we do? Can we do anything?” We felt both very helpless. What was supposed to be a natural paradise looked like a trash pit. Everywhere! Photos cannot really cover how it looks like and how it felt to walk through all of that trash. I have heard of the problem before, I guess a lot of people have. A documentary came to my mind we had seen a few months ago in Germany. 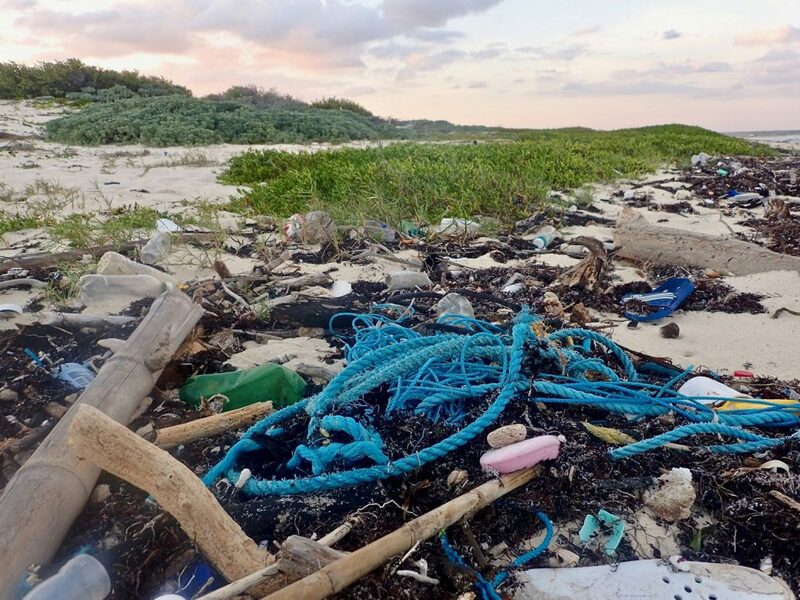 It’s called “A plastic ocean”. Sitting in a cinema chair it wasn’t too bad at all. Watching the news on a regular basis you get trained to swallow all kinds of bad news and catastrophes without worrying too much. Standing on the plastic littered beach was something completely different. It touched my heart and a voice screamed in my head: Are we really doing this?? Some words to think about…. At night in my tent, I finished the book I was reading. The last paragraph made me think for a long time especially after what I had seen that day. Do we sometimes think about the consequences of our behaviour at all? “Sometimes, a society can see its end approaching from afar and still not be able to adapt, like the Maya; at other times, the curtain drops without warning and the show is over. 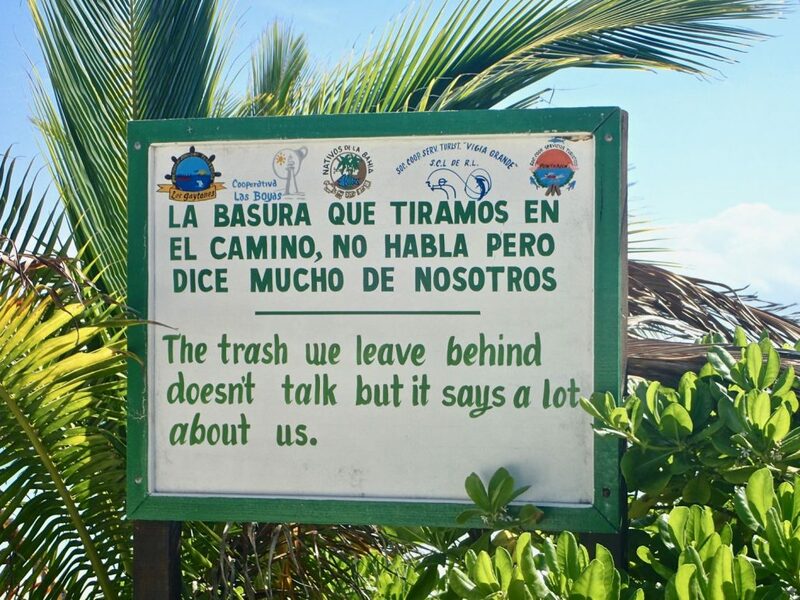 After a night of camping on a trashy beach we cycled towards Punta Allen. From there we wanted to get a boat to the other side of the lagoon. The road offered tropical jungle left and right and we were occasionally overtaken by some tourist cars or adventure jeep tours. Arriving at Punta Allen which seemed to be a sleepy tourist destination it was time for our usual lunch break. We took a seat in a local restaurant and ordered Tacos and Fajitas. How to get to the mainland with two bicycles? Our task for the afternoon was to find a fisherman’s boat that would take us to the other side of the lagoon. We made our way to the jetty. 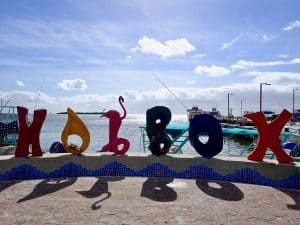 Unfortunately Punta Allen didn’t seem to have any fishing boats left. All we could see were tourist boats. Brad talked for a while to one of the guys in Spanish but he went away to have lunch. We took a seat inside the wooden hut at the end of the jetty and had a close look at a rotting sailing boat lying in the water. 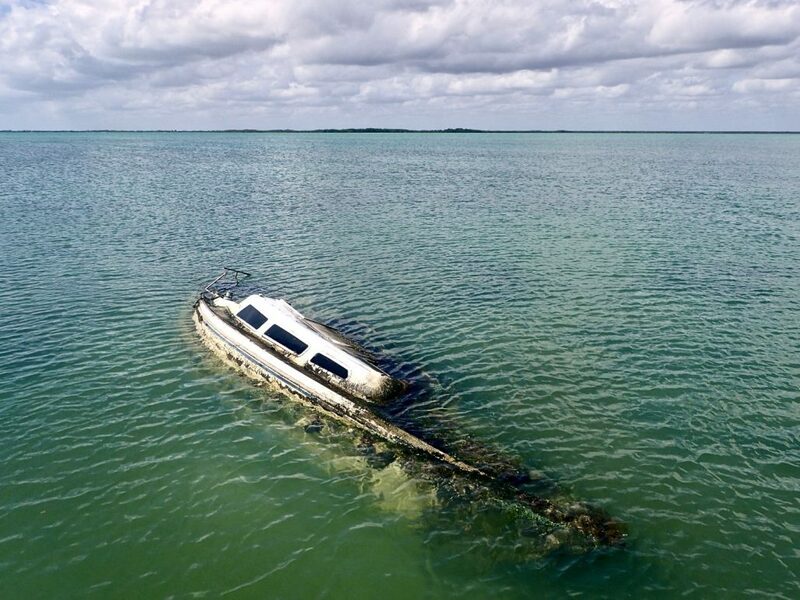 Maybe a remain of a hurricane long ago. After a while another tourist boat came to the jetty and the young man was willing to give us a lift. For MEX$ 100 (5 Euro) he took us and our two bicycles on a five minutes boat ride across to the other side. 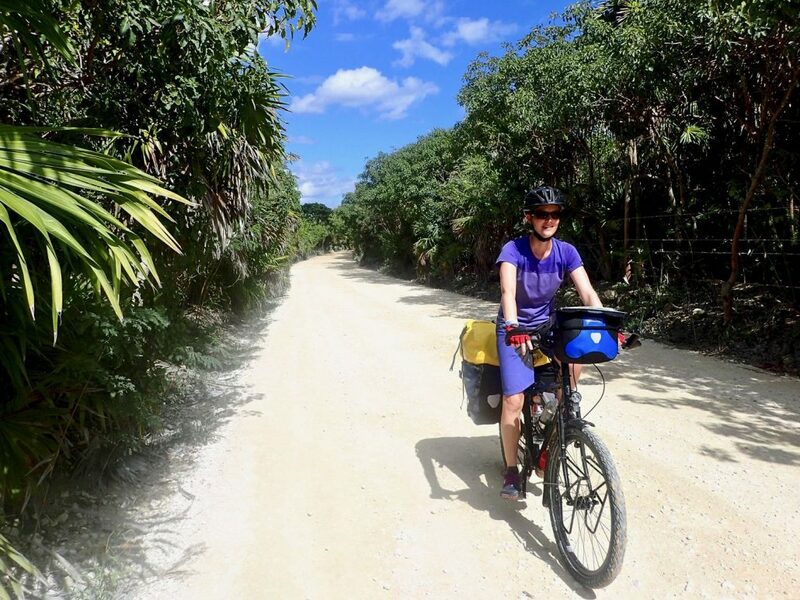 In the hot midday sun we continued our adventure of cycling through Sian Ka’an Biosphere Reserve. 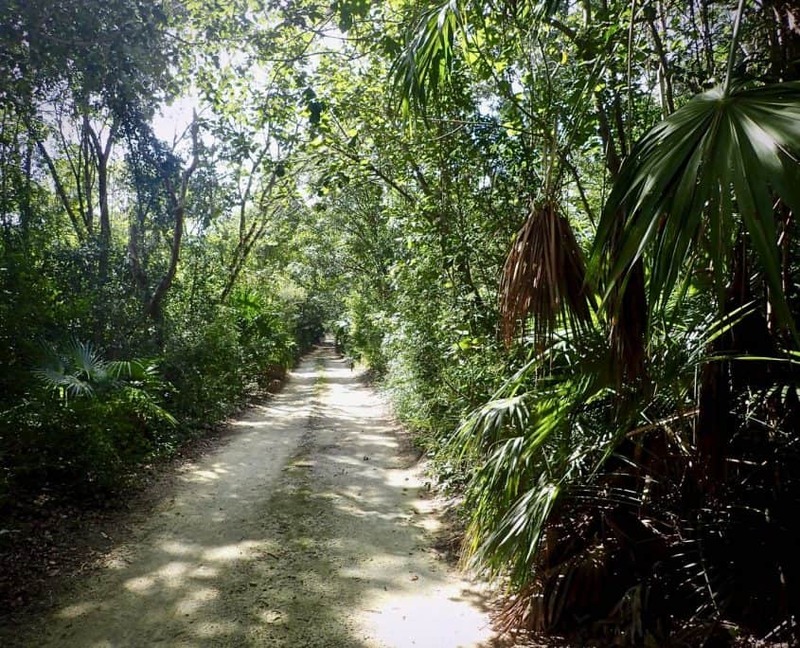 The first 4 kilometers led us through swamplands with mangroves left and right. In my mind I could literally see all the crocodiles that lived here. But not a single one showed up. Instead we saw some birds and stopped for the occasional photo. I even got a shot of a pink spoonbill! Cycling through this area we could both imagine why this was a great place for birdwatching. 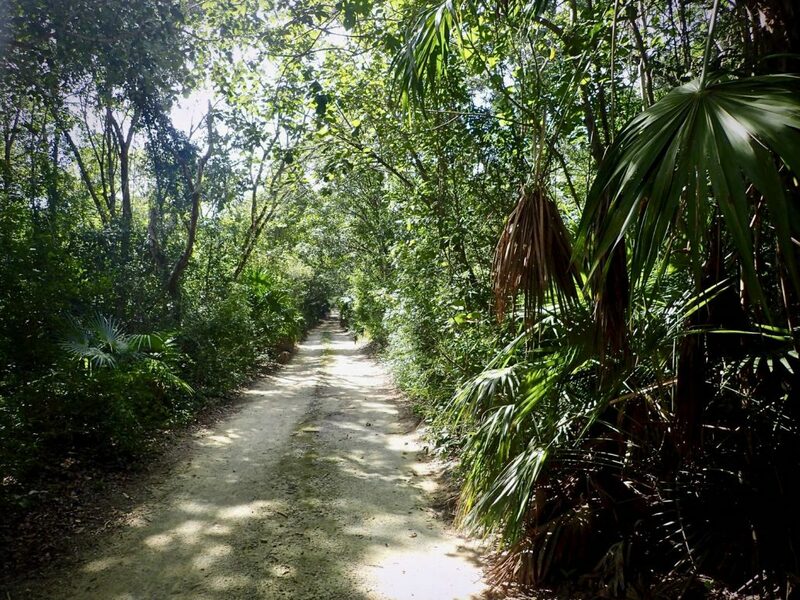 It was hot in the sun and so I felt a little relieved when the trees grew bigger and we cycled into the jungle. 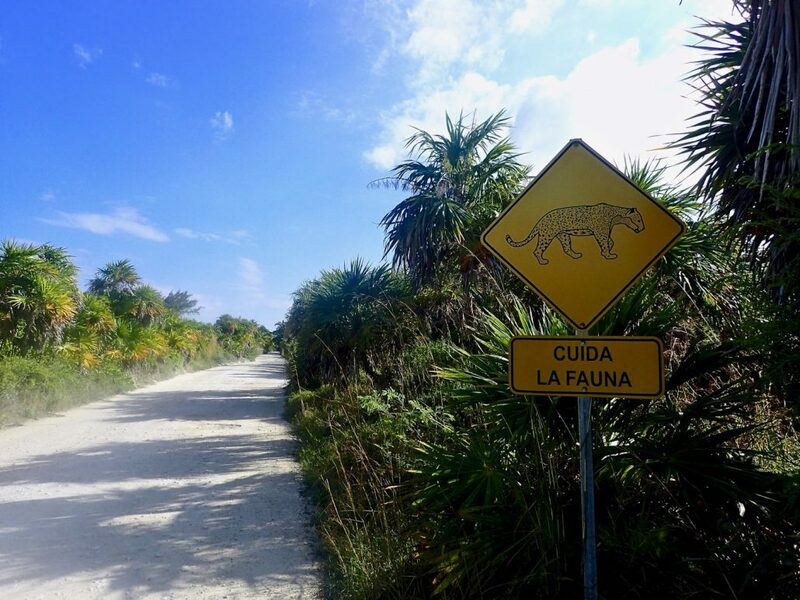 It was exciting to ride through an area knowing there could be a crocodile or even a jaguar around the corner. But all I ever saw were thousands of mosquitos! At the end of the we were lucky to find a big open and nearly mosquito-free area to set up camp. After a nice dinner of Totopos (Tortilla-Chips) with self-made Guacamole I got comfortable in the tent. 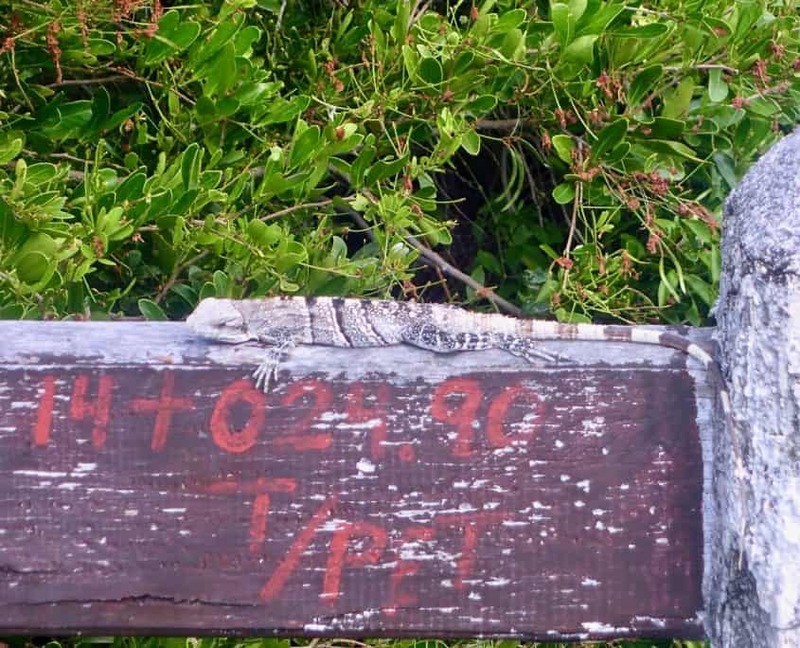 The Sian Ka’an Biosphere Reserve left mixed feelings inside of me. On one hand it showed some awesome nature with wonderful palm trees and lots of animals living there but on the other hand it also showed a huge amount of human impact. 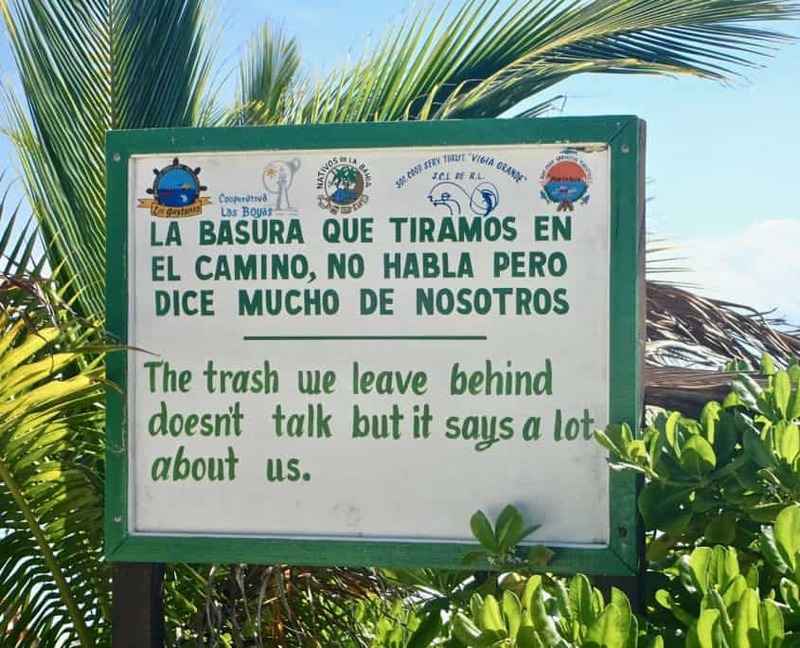 I guess I will never forget the amount of trash I’ve seen on these beaches! In total it wasn’t the place we expected to cycle through and we didn’t find the tropical paradise some guidebooks promised. 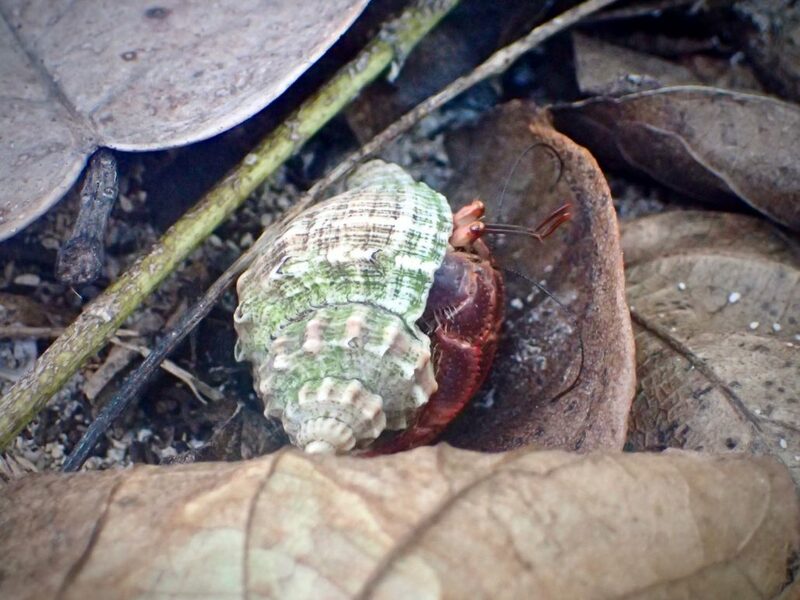 The fact that we didn’t see any of the exceptional wildlife was also a little bit disappointing. But who knows? Maybe we will be more lucky in the jungle of Belize or the high mountains of Guatemala. 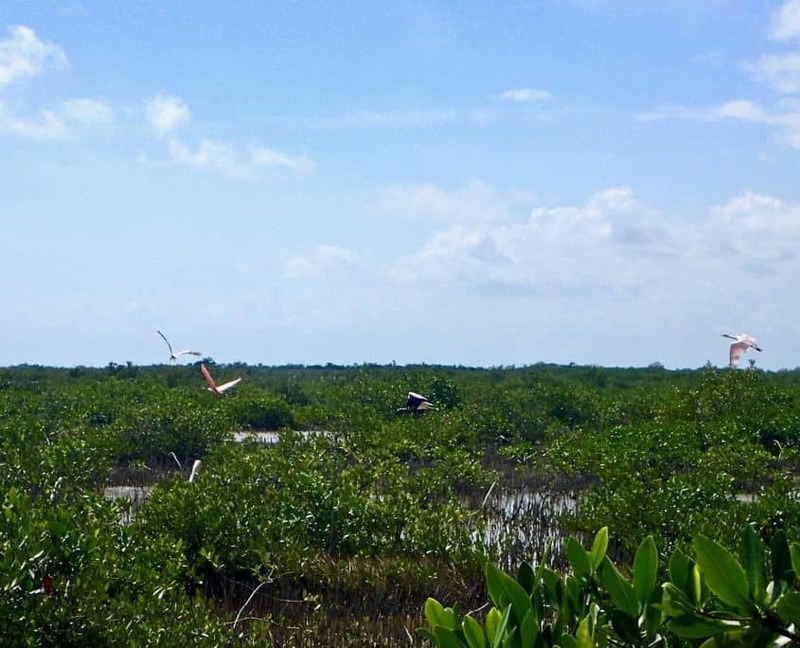 Very nice content and useful information provided related to the biosphere of Sian Ka’an. Thank you very much! 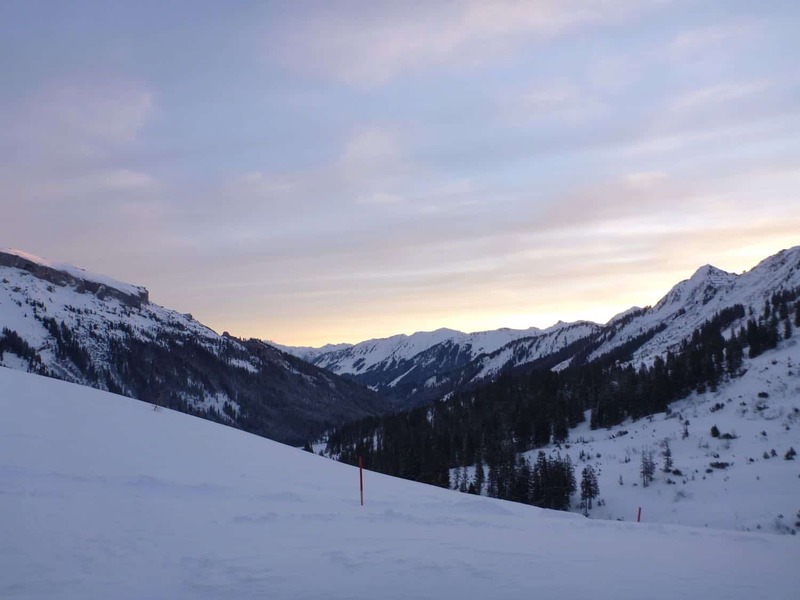 It is definitely a great place to visit!